When Hurricane Harvey barreled ashore Aug. 25, it disrupted schooling for as many as 1.4 million Texas public school students or about one of every four pupils in the state. Sixty counties in the Coastal Bend and Houston area have now been declared disaster areas by Gov. Greg Abbott. Most districts and charter schools have re-opened. However, a few districts that suffered severe damage, such as Aransas County ISD, Aransas Pass ISD and Port Aransas ISD, estimate that they will not open until October. Commissioner of Education Mike Morath recently told the State Board of Education that Texas educators have provided numerous “acts of heroism” as they’ve helped their communities respond to the hurricane and related flooding. For example, about three dozen schools in the Houston area alone served as emergency shelters. “What we have seen was public service on an epic scale,” Morath said. The 2017 Heroes for Children reicipients are (front row, left to right) Mary Pencis, Amanda Rogers, Carol Ann Youens, Stacie Jahn, Cyndi Matteson, Maria Vega, Olga Charles, (back row, left to right) Charles Lyons, Evelyn Lyles, Ian Hemmings, Teresa Cook, Chelsea Elliott, Thomas French, Mike Senchack. Not pictured is Frederick Jefferson. 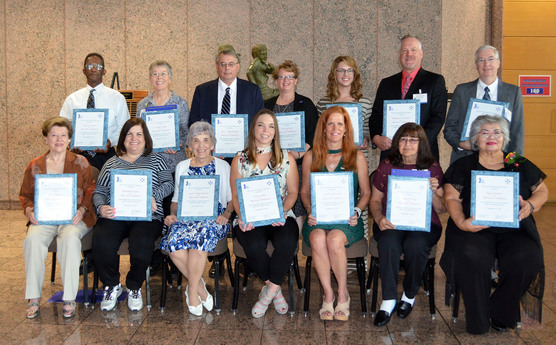 Fifteen school volunteers who have by a conservative estimate collectively provided 127 years of serve to Texas public schools were named Heroes for Children by the State Board of Education (SBOE) in September. The Heroes for Children honorees are selected annually by board members and recognized for their volunteerism in the public schools of their communities. Each hero received an individual plaque recognizing his or her service, a copy of the resolution approved by the board and photographs commemorating the ceremony. Each hero’s name is also engraved on a plaque that is permanently displayed at the Texas Education Agency. 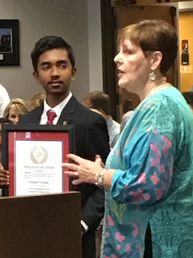 The State Board of Education recently honored Pranay Varada, who is the 2017 National Geographic Bee winner. Last school year as an eighth-grade student in the Carrollton-Farmers Branch Independent School District, Varada was one of 2.6 million students nationwide who competed in the bee. He studied intensively during the 2016-2017 school year as he was determined to improve his previous year’s standing when he finished in sixth place nationally. Work is under way to create a new Long-Range Plan for Public Education, which is expected to establish goals for Texas public schools through the year 2030. The State Board of Education (SBOE), which under Texas law is required to adopt a plan, recently appointed the Long-Range Plan for Public Education Steering Committee, based on the advice of The Boston Consulting Group. This 18-member steering committee, made up of state board members, various stakeholder group representatives and representatives from three state agencies, held its first meeting Sept. 12. The committee learned about the state’s changing demographics and examined other state’s long-range plans during the initial meeting. Stay up-to-date with the committee’s work at http://tea.texas.gov/SBOE/long-range_plan/. Two Coppell businesses are the recipients of the 2017 Employers for Education Excellence award. Earning the gold-level award are Las Colinas Federal Credit Union and The Depository Trust & Clearing Corporation (DTCC), a market infrastructure provider for the global financial services industry. “These businesses, like so many others across the state, provide valuable support to our Texas public schools. Through the businesses’ commitment of time and resources, they provide practical assistance that helps to build strong schools and communities,” said Donna Bahorich, chair of the State Board of Education. A summary of actions taken at the Sept. 15 State Board of Education meeting is now available.